ZANESVILLE - The Zanesville area becomes a tourist hot spot this month, as thousands of pottery collectors descend on local hotels, restaurants and museums during Pottery Week. 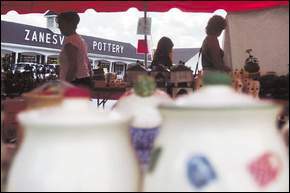 Buckeye Stoneware was one of many vendors at Zanesville Pottery and China in the file photo above. Groups like Pottery Lovers, the McCoy Pottery Collectors Society and the Hull Pottery Convention have booked hotels almost solid for Pottery Week. Groups like Pottery Lovers, the McCoy Pottery Collectors Society and the Hull Pottery Convention have booked hotels almost solid. Tourists have detailed schedules for the week, including auctions, pottery shows, museum tours and reunions. The week of July 7 through 16 is the city's largest convention of the year. Economically, the festival is a boon for the area. "The pottery lovers use this time as their vacation," said Kelly Ashby, vice president of the Zanesville-Muskingum County Chamber of Commerce. "They're eating at our restaurants and they're staying at our hotels, they're shopping at our antique stores. They're spending their extra time doing what tourists do." The Holiday Inn-Zanesville on East Pike is completely booked the weekend before the festival, and is almost full during the week. The collectors' group Pottery Lovers books rooms at the inn every year, and most visitors check into their regular room. "We block the whole hotel for them," said David Huston, Holiday Inn director of sales and marketing. "Zanesville's pretty much theirs for about a week and a half." Jen Stofft, of Pottery Lovers, has used the same hotel room for more than a decade. She started coming to the festival about 35 years ago. She and her husband collected Roseville and Weller pieces. Now, Stofft has formed lasting friendships with the people she sees every year in Zanesville. People come from as far away as Canada, California and Texas. "Our motto is, come and have a good time," she said. The National Ceramic Museum and Historical Site in Roseville has planned a host of activities for pottery enthusiasts in July, including parking lot sales, tours, auctions and displays. To open pottery week, the museum starts with a plate-breaking ceremony. Someone will take a hammer to a freshly made plate, then auction off 10 other plates just like it. The museum's big draws this year include exhibits of McCoy and Gondor pottery. "We absolutely get a great deal of out-of-town traffic," said Director Mary Ellen Winegartner. "Our visitation is always expanded during that time frame. We do more tours. It's such an enjoyable period since we have so many activities that are available here during the day." A tourist from the McCoy Pottery Collectors Society is eager to see the new museum exhibit of her favorite pottery line. Society President Chiquita Prestwood first met Nelson and Billie McCoy, who ran McCoy Pottery, at the society's first meeting in Zanesville. The McCoys are still involved in the group's yearly reunion here. Prestwood said her yearly visit is an opportunity to see the pottery legends. "Camaraderie is just as important if not more important than buying pottery," she said. "Zanesville's just like a second home."